So you’re planning a wedding — congratulations! Whether your special day is coming in weeks, months or a year from now, there’s lots to be done, and there’s likely no time to waste in putting a plan together. We’ve all been guests at events where it has been difficult to find something safe and gluten free to eat. But now you are the host or hostess and are in charge of choosing the edible options. How do you satisfy a crowd and yourself safely, affordably and tastily? Fresh off the planning and execution of my gluten- and dairy-free wedding, I assure you that adding the extra layer of complexity that dietary restrictions so often bring doesn’t have to be painful or expensive. It also shouldn’t define the occasion. I knew who we were inviting to join in our celebration and was aware of most, if not all, other dietary restrictions I should be considering in my planning. I wanted those guests to be free to enjoy a worry-free party alongside everyone else. Our goal was to share an evening where no one (least of all me, the gluten-free bride!) would have to worry about ingredients or cross-contact, and no one would go hungry. I also didn’t want those who could blissfully eat their way through any festivities to realize that they were enjoying foods that were absent gluten, dairy and peanuts. Grab your notebook and follow along as I share how I planned a reception our guests are still raving about. And I did it all without undue stress, expense and, most importantly, gluten in only about four months. Depending on the season and time of day for your big event, some locations will work better than others. Perhaps you have the luxury of having a friend or family member with a large home or garden that you can make use of. In that case, you can control all aspects of the food and drink and keep expenses in check. If you are looking for a location to rent for your reception, you may be limited to certain catering companies. If so, choosing the right place dictates whether you can use a caterer who is right for you, as well. I’ve found that most locations, when pressed, really don’t understand gluten free and cross-contact prevention. When you ask enough questions, and they begin to realize they don’t understand it either, you can start asking for special exceptions, which can actually save you money. The venue we used allowed me to break all the rules: I brought in my own gluten-free pretzels, chips, hummus, trail mix, cookies and cake, saving us a bundle on items facilities usually mark up several hundred percent for profit. We set these munchies around at stations, at the bar and on high-top tables so guests always had something to eat within arm’s reach. If you are not serving a lot of food, especially if you are not having a sit-down dinner, you don’t want your guests to feel hungry, and little nibbles can keep them satisfied. Decide whether you really need to offer a full-course meal. If so, a buffet is the easiest route to take, allowing guests to pick and choose what they’d like, saving food from going to waste. Buffets also allow you to have themed stations that can be festive and food allergy friendly. There is simply no need for gluten-containing foods to be alongside gluten-free foods. If all of your choices are gluten free, you don’t have to worry about cross-contamination. Fortunately, there are enough delicious gluten-free options available that guests should not turn up their noses at something new just because it’s gluten free. Popular wedding food themes can include anything from build-your-own tacos, carving stations and grilled vegetables to steamed shrimp, sushi or raw oysters—all are naturally or easily made gluten free and free of other food allergens, if needed. Even pasta bars can be made 100 percent gluten free if your caterer uses your choice of gluten-free pasta. Another wonderful option is to choose an ethnic food theme, such as Thai, Vietnamese, Mexican or Italian. Many Asian dishes are rice based and are naturally gluten free or are easily made so by using gluten-free tamari in place of soy sauce. Fresh spring rolls are gluten free when wrapped in gluten-free rice paper; be sure to select a gluten-free dipping sauce. Corn tortillas, salsas and beans are almost always already gluten free, and Italian dishes are easily converted by using gluten-free pasta or pizza crusts or opting for risotto-based dishes instead. 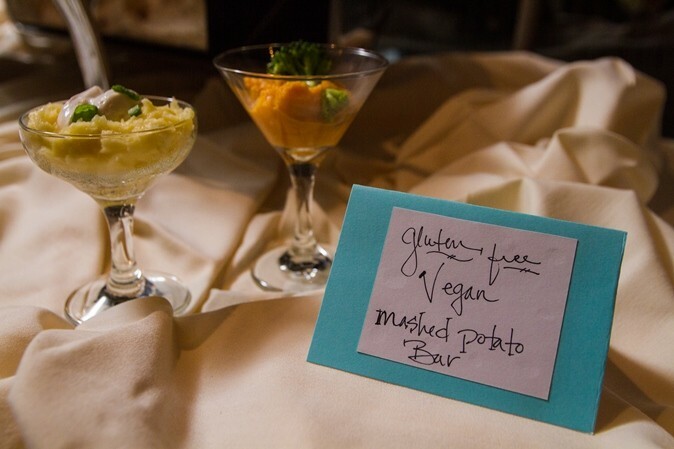 We opted for a vegan and gluten-free mashed potato and mashed sweet potato bar that everyone loved. The novelty of it, the simplicity of it, and the fact that every person at the reception could enjoy it were only matched by the fact that it was totally delicious and filling. Offering a yummy starch like a potato is also a great option when alcohol is served so no one is drinking on an empty stomach—a bonus not to be overlooked when choosing your wedding reception menu. 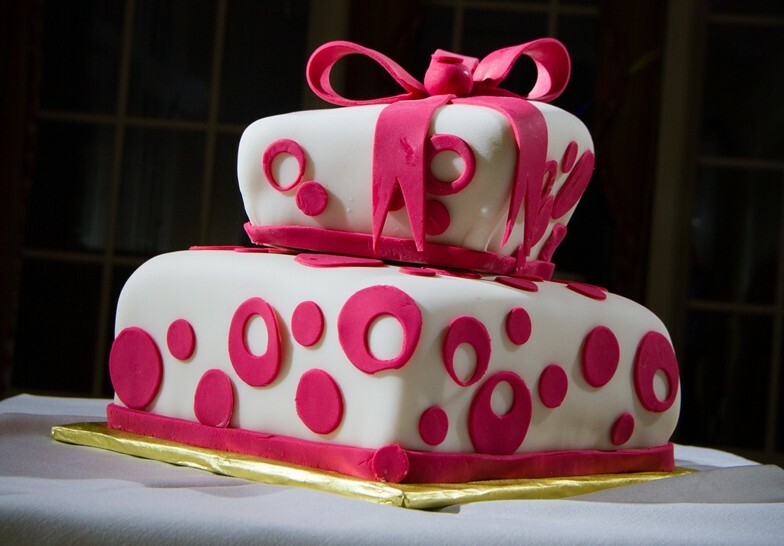 The cake continues to be the centerpiece of many wedding receptions, and most couples want one that reflects their taste and tastes good, too. You don’t have to give up those special qualities just because your cake is gluten free. Of course it’s always an option to make your own gluten-free wedding cake, but adding the stress of that task to your excitement and pre-wedding busyness is not ideal. Even with my baking experience, I did not make my own cake. Perhaps you have a friend or family member who would like to take on the task. Or you could even opt for ever-popular cupcakes. They can be presented beautifully, are easy to hold and to serve and are much easier to make and to decorate than a traditional wedding cake. And they are super trendy right now. The eye-catching, palate-pleasing cake served at the wedding. Get the recipe below. Photo by Robert Betz. Don’t rule out commercial bakeries as another place to turn for your gluten-free wedding cake. There are more and more bakeries around the country that now offer such options. Simply search Google for “gluten-free,” “bakery” and the closest large town, and bakery choices are bound to appear. Some are dedicated gluten-free shops, and others make regular wheat flour cakes as well, so visit the shops before selecting one. Ask to do a tasting only after you speak to them about how they will keep your cake free of cross-contact with wheat flour. Sometimes bakeries will agree to decorate a gluten- free cake you bring to them, already baked. You may be able to work this out with the bakers on staff, but it’s still crucial to ensure that the cake decorating environment and the tools they will use will be free of gluten. There is no substitute for visiting the bakery yourself, asking questions and viewing the space to decide for yourself if you believe the facility can prepare your cake in a gluten-free manner. Think local: crafts, edibles, mementos. Local honey, fresh-made jams, pressed flowers, hand-dipped candles or a carved wooden trinket all make favors that give guests a way to remember the occasion. The classic wedding favor is an organza bag filled with Jordan Almonds tied with a ribbon of the same color as the bridesmaids’ dresses. Alas, Jordan Almonds are not gluten free, as they contain wheat dextrin. Some even contain flour as an ingredient. Luckily, we have a perfect gluten-free substitute in M&M Almonds (although they do contain dairy). It’s also easy to find inexpensive, nonfood items to give your guests. If you’re planning a wedding you already know how many things you can find online. Myweddingfavors.com and beau-coup.com are among many that have options in every price range. And you’ll find lots homemade ideas on Pinterest, too. Believe it or not, you can skip the favors. Your guests aren’t in elementary school. No guest will wonder why they didn’t leave with a keepsake, so don’t let this detail add to your planning stress or break your budget. Jules Shepard and her husband, Jeff. Photo by Robert Betz. When the bride or groom is gluten free, you can happily share food that fits your diet without having to compromise by allowing gluten or limiting your options. It’s not necessary to do either, so don’t think for a moment that you must consider it. The most memorable weddings focus on the joy a bride and groom share with friends and family. The food you serve should be the safe, stress-free icing on the cake! 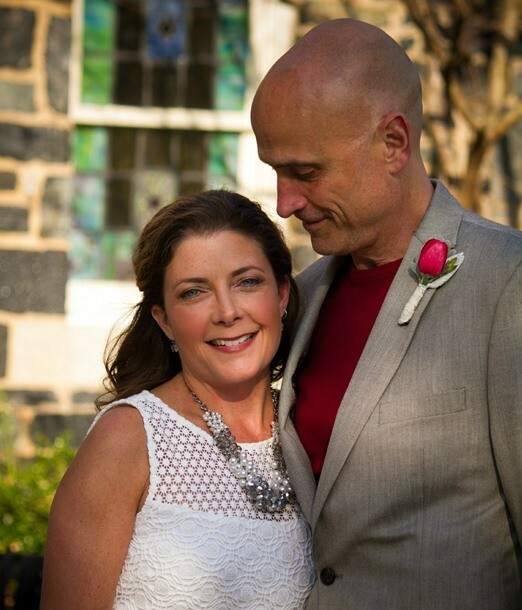 Jules Shepard, gluten-free cookbook author, blogger and founder of gfJules Gluten-Free Flour and Baking Mixes, has now been happily married for 4 months. Like the meals she serves her husband and family, her wedding was entirely gluten free. Get the recipes for Jules’ Wedding Cake and Jules’ Mexican Wedding Cookies. Don’t settle when it comes to the foods you choose; the right caterer will be able to help you design an interesting menu that fits your budget and will safely serve all your guests. Ask the following questions to narrow down your choices in caterers and bakers. The answers should help you quickly determine whether you trust that a baker or caterer understands gluten-free options and how to prevent cross-contact. If, after the interview, you don’t have a good feeling about using one for your wedding, keep looking. Ask for referrals from friends and dig deeper in your Internet searching. You will find a caterer or bakery if you give yourself enough time to look and you don’t lower your standards. • Have you ever catered an event that was entirely gluten free? • What menu options do you currently have that are gluten free? • Are there dedicated areas in your catering kitchen that are gluten and allergen free? • How do you handle producing foods for special diets? • Are there airborne flours in your kitchen, and do you make your own breads or pastries? • Do you have separate pans and utensils for preparing gluten-free foods? • Is your staff trained in the safe production and handling of gluten-free foods? • Will you use the pasta or other ingredients that I choose or bring to you to prepare?